The hidden message of “The Oath’’ is so inescapable as to be Shakespearean: Character will out. A documentary that at its start purports to be the tale of two terrorists, the film keeps deepening and widening until it becomes a subtle, stubborn moral drama about users and the used. It offers a glimpse into the inner workings of Al Qaeda and the legal arms of the US military, and it scrambles all our assumptions about the post-9/11 world by asking us to judge men not by their beliefs but by their actions, or by their refusal to act. “The Oath’’ asks a lot but gives much in return. Of the two subjects in Laura Poitras’s film, only one is seen. Boy, is he seen. 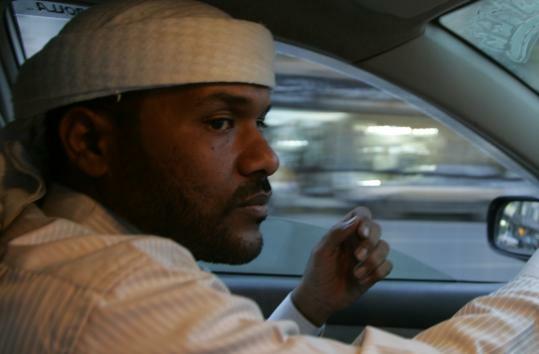 Abu Jandal worked as Osama bin Laden’s personal bodyguard from 1996 to 2000, and when the film catches up with him in the late 2000s, he’s driving a cab in Yemen. A family man and a committed jihadist, Jandal inculcates his young son in the sins of America (the kid would rather watch “Tom and Jerry’’ cartoons) and holds recruitment meetings in his living room, trying to convince diffident young Muslims to sign up for holy martyrdom. He’s also a slick public brand: the terrorist who talks. We see Jandal interviewed on “60 Minutes’’ and Al Arabiya TV, discussing his personal relationship with bin Laden and nimbly dodging the issue of what, specifically, he did and what he now believes. The more we watch Jandal, the more we suspect he’s a fame whore, and a duplicitous one at that. He allows Poitras to mount a camera on his cab’s dashboard but lies to passengers about when it’s on. Brick by brick, Poitras builds a dual portrait of an opportunist and a victim, and it is damning both to Jandal and to the Bush administration. The baby-faced Mizer — a character who’s worth his own documentary — takes his client’s case all the way to the Supreme Court, which ruled in the 2006 decision Hamdan v. Rumsfeld that the United States violated the Geneva Convention in its treatment of Guantanamo detainees. The response of Congress was to pass a law that allowed the government to file new charges against Hamdan. A jury trial followed in 2008, and “The Oath’’ patiently builds suspense as it awaits the outcome. The underlying question asked by the film is why this man — who even the US chief prosecutor compared to “the two of clubs’’ — is being prosecuted while Jandal, a wily ace, remains free and flourishing. The answer finally arrives buried in the bland, bureaucratic pages of an interrogation report, offering incontrovertible proof of Jandal’s treachery toward his colleagues and family. The film’s title turns out to be cauterizing in its irony: In the world of “The Oath,’’ rats are rewarded and the unlucky are punished. There’s a happy ending, of sorts, but it seems almost accidental. Karma can undo what hatred and red tape have done, but the lesson of this movie is that waiting for karma just isn’t enough.